Tap the word File from the Ribbon. The Ribbon stretches across each program’s top. Tapping different words on the Ribbon — Format, for example — shows different commands related to formatting your document. Tapping File reveals file-related commands including Print. Choose your printer, adjust its settings if necessary, and tap Print. If you want only one copy of your document sent to the printer you normally use, just tap the Print button. If you need to do a little tweaking, adjust the settings before tapping the print button. You will need to make sure that you have connected your Surface to a printer. Desktop programs include built-in print commands that allow more customized print jobs. 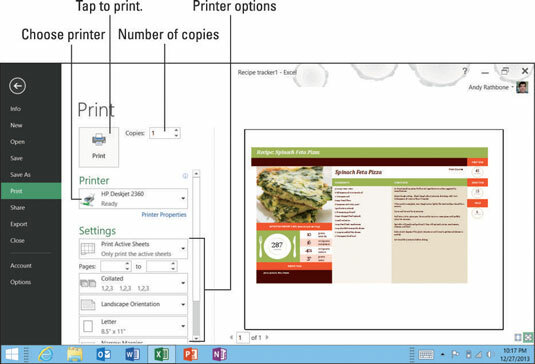 Start screen apps, by contrast, require you to open the Charms bar, choose Devices, and select your printer in order to print. Need to give a PowerPoint presentation? You can also do that from your Surface.